When selecting your wedding flowers, one of the first things you may do is pick the shape and style of your bridal bouquet. 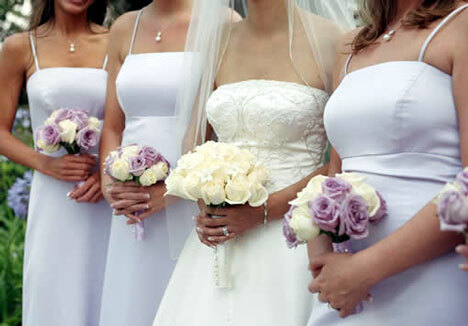 Generally, bridal bouquets are thought of in three shapes: round, hand-tied and cascade. 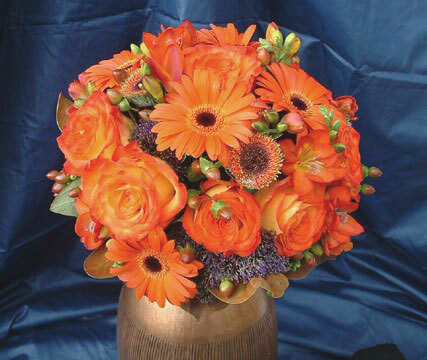 However there are many more types of bouquets that you should consider. Get familiar with these terms before heading to the florist to choose your bridal bouquet. The round bouquet comes in various sizes, from tiny, delicate versions to bold, beautiful choices. The common factor is that the flowers are shaped into a round top. 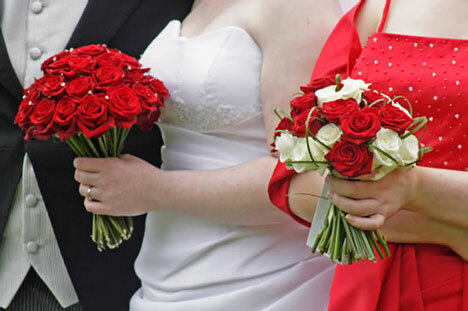 Round bouquets are either hand-tied or wired. The posy bouquet is small. It's easy for the bride to hold in one hand. Posy bouquets usually come in two styles -- hand-tied or wired. The hand-tied posy is loose and tied with a simple ribbon or other material. The more structured wired posy has the stems of the flowers removed and replaced with florist wire. The posy bouquet generally doesn't have much greenery. The nosegay bouquet is small and round, containing both flowers and greenery. Traditionally, the nosegay was held in a tussy mussy -- a small cone shaped holder that is metal or glass. The tussy mussy holders can be placed on the table at your reception to display the bridal and bridemaid bouquets during the wedding festivities. Also called the shower bouquet, these large, formal bouquets consist of a round of flowers that trails into a long v-shape in the front. Some cascade bouquets are just long enough to cover the bride's hands, while others trail all the way to the floor. 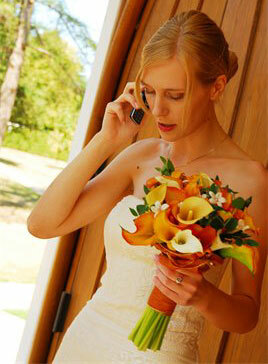 The smaller version of the cascading bouquet is often referred to as the teardrop bouquet. The clutch bouquet is basically a loose, hand-tied bouquet where the stems are left longer. These loose bouquets are beautiful options for outdoor or garden weddings. 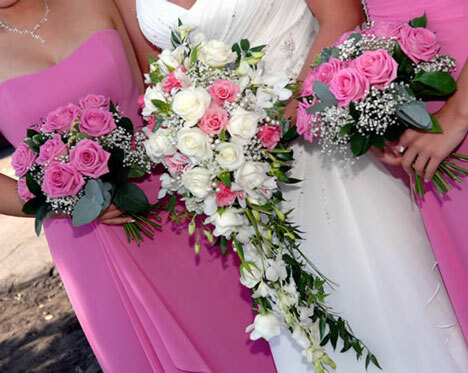 Also known as the arm bouquet, arm sheaf or pageant bouquet, the presentation bouquet is made of long-stemmed flowers that are craded in the crook of the bride's arm. Think of a beauty pageant winner. 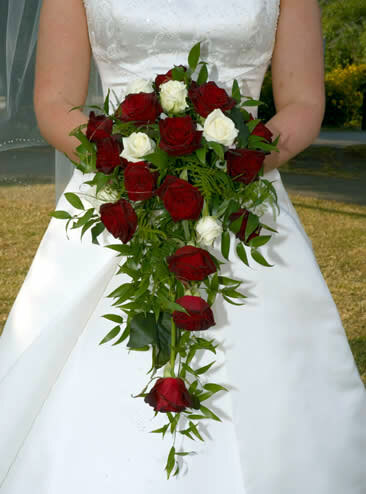 These types of bouquets are not very popular because they are a bit inconvenient. However, the look is very beautiful and formal. 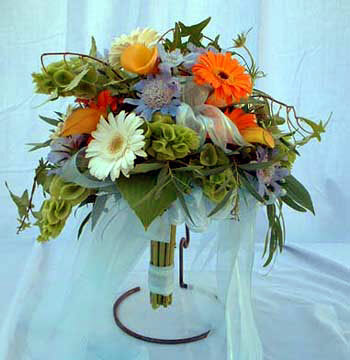 The Beidermeier bouquet is a round bouquet that is normally large. It's unique because it's made up of several types of flowers arranged in a circular pattern. 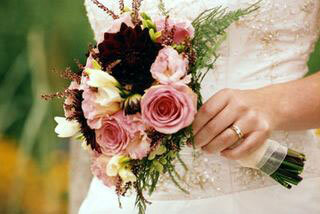 Each ring of the bouquet is comprised of a different type of flower. 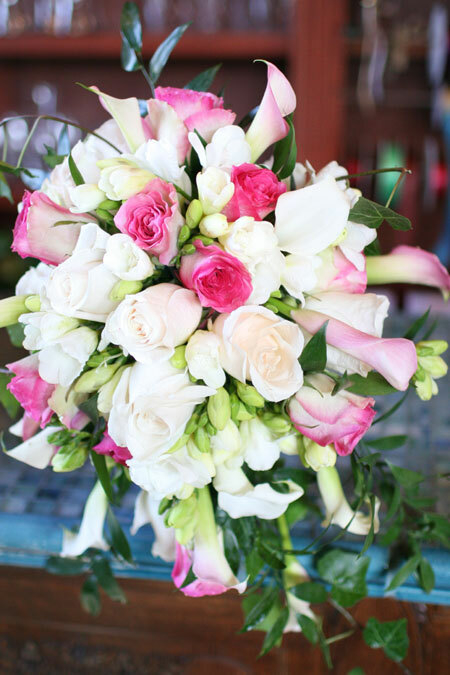 The crescent bouquet is an arched bouquet of flowers and greenery that trails down on both sides. These large, dramatic bouquets can be symmetrical with both the left and right sides even, or asymmetrical for a more contemporary look. 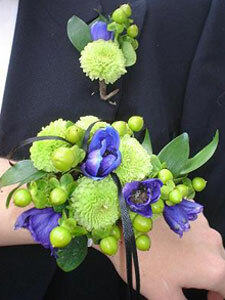 A wristlet or flower bracelet bouquet is a wrist corsage. 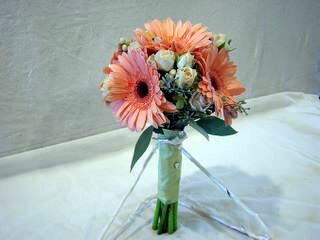 This small bouquet is popular with brides and bridesmaids who want to remain hands-free. The flowers and foilage is attached to an elastic wrist bracelet. The pomander bouquet is a ball of flowers that is suspended from a ribbon. 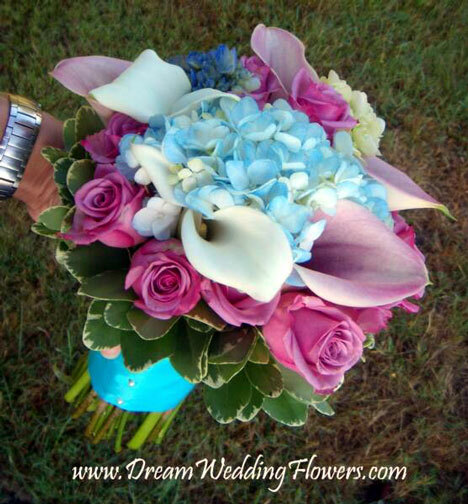 This type of bouquet is easy for junior bridesmaids and flower girls to carry. You might also know the pomander bouqet as the kissing ball. Though this is not a common bouquet in modern weddings, it is definitely unique. A simple bouquet is attached to a lacy plastic fan. Inspired by the Victorian Era, these vintage looking bouquets became popular again in the 1980s but faded again for the most part. Other types of bouquets include the composite bouquet (where petals are glued together to form a large bloom), the cone bouquet (where the cone is made up of flowers or other material) and the single stem. More? Lots of related articles, listed below. Or surf the websites of hundreds of floral specialists, organised by region, in our directory.